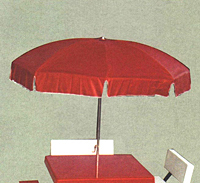 [XPB-UV-X] [ DISCONTINUED ] Vinyl Umbrellas are 3-ply with nylon scrim reinforcing between the layers. They are 7 1/2 ft. dia. of solid color or alternating 2 - color panels. Each comes with a 1 1/2 inch dia. aluminum pole with tilt mechanism and crank folding. Specify color(s). Royal Blue, Cream, Hunter Green, Red, Kelly Green, White, or Yellow. For shipping quotes, orders or questions please call our Customer Service Center at 1-877-483-9270.